Intermodal, drayage, bobtail? All words that probably do not mean very much to the average person. As someone who is new to not only DrayNow but the intermodal trucking world, I expected a bit of a learning curve, and I wasn’t wrong. Everyone on the team thought it was hilarious when I accidentally referred to a flatbed truck as a hotshot, so I decided that I needed to work even harder to keep my vocabulary straight. I’m lucky to work with talented and passionate people with years of experience in freight and trucking, who I learn so much from every single day. As I’m getting up to speed, I thought I would share a little intermodal cheat sheet for newbies like myself. Cargo: Also known as freight or loads. These are the goods or materials being shipped and hauled. For DrayNow, this can be found in the intermodal containers drivers who use our app haul every day. Container (Intermodal Container): This holds the freight. Intermodal containers have a standard size so they can be seamlessly moved from one type of transportation like ports and railyards to others, like trucks. They are connected to tractors as trailers, and then hauled from one location to another. 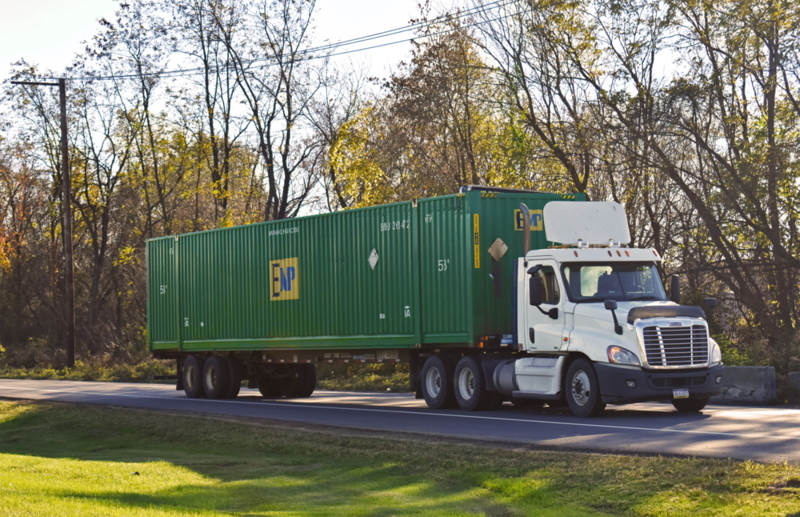 While most containers, globally, are 20’ or 40’ long, many containers in the U.S. and Canada are 45’, 48’, or 53’. DrayNow carriers move 53’ domestic containers. Transporting or moving goods over short distances. Yep, this puts the ‘Dray’ in DrayNow! Drayage: The process of transporting or moving goods over short distances. It is usually the part of the process where a trucking services moves freight from a railyard or port to a warehouse or other distribution center. Yep, this puts the ‘Dray’ in DrayNow! Drivers and Carriers: Who DrayNow (and everyone, really) relies upon to haul freight. Drivers have their Commercial Driving License (CDL), and for DrayNow, have to be owner operators with their own authority. Operating authority means that the carrier and/or driver had been granted authority for interstate commerce with the Federal Motor Carrier Safety Administration. Freight Brokers, IMCs (Intermodal Market Companies), and 3PLs: While each of these offer different services, they all aggregate services to move cargo on behalf of shippers. They connect multiple parties, equipment, and facilities needed to move and sometimes store cargo, generally providing a single bill to the end-customer (shipper). Each of these are DrayNow customers, placing freight on the DrayNow Marketplace to be booked by Carriers. Intermodal: A type of transport that involves multiple types of transportation (such as train and trucks) to move freight from one point to another. The word itself means “between modes.” DrayNow plays a part in this journey, with a technology that enables Brokers and Carriers to more easily move freight from railyards to places like warehouses and distribution centers. Loadboard: Web-based tools that match drivers with freight or loads that needs to be moved. Though DrayNow is not a loadboard, we do give drivers access to freight they would normally have to access directly through a shipper, broker or dispatcher. DrayNow’s loads can be accessed by drivers via our Android app. Tandem Axle Tractor: The type of tractor that DrayNow drivers use. This tractor allows drivers to pull the 53’ intermodal containers that are used in intermodal shipping. These tractors have a double axel in the back, which means it can carry more weight than other types of tractors. Tractor-Trailer: What most of us think of when we think of trucks. The front part is the tractor, or the truck. The trailer or container behind it is where goods are stored. There is a huge variety of trailers in general. Trailers can be refrigerated, they can be oil tankers, or flatbeds. DrayNow drivers pull 53’ containers with their tractors. There are also a lot of phrases used to describe tractor trailers like bobtailing and deadheading. Bobtailing is when a tractor drives with no trailer. Deadheading is when a tractor is pulling a trailer or container that is empty. Tractors that have sleeping space in the back are called sleepers or condo tractors. Ones without that space are referred to as Day Cabs. I think those are the basics! If you want a really deep dive into the Intermodal trucking world, we recommend this glossary. The trucking world is so integral to our economy and our way of life, yet most of us don’t even know the first thing about how the goods we buy get into stores and onto shelves. I’m really enjoying getting to know DrayNow’s part of the trucking industry. If you are interested in learning more about DrayNow or the technology we are interjecting into the intermodal industry, please feel free to get in touch with us at here or drop us an email at truck@draynow.com.